Cast your mind back to your childhood. You’re the protagonist and your choices determine the outcome of the story. 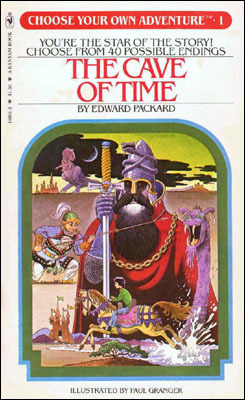 Remember when you got to choose your own adventure? The outcome was not a fixed point and you got to choose how your adventure would unfold. You had agency in the story and your choices led to an array of possible futures. After the Digital Preservation Management Workshop, this is how I now see the once mysterious world of digital preservation. Over the course of three days, Nancy McGovern and Kari Smith set the stage and laid the groundwork. Now it’s up to us to choose our path. I was first exposed to the concept of digital preservation while working at Library and Archives Canada. I was part of a small group that was tasked with performing user testing for a new trusted digital repository that LAC was in the process of building. I was a #digipres guinea pig, with no concept of how digital preservation was actually accomplished. Unfortunately, this LAC program was never fully realized, but I can say that it introduced me to the concept of creating a trusted repository for digital content. Ever since, the need for digital preservation has remained a kernel of an idea gnawing at me in the back of mind. The idea is that the archival profession has a seemingly insurmountable challenge ahead of it, but that I don’t feel equipped to handle it and wouldn’t know where to begin. Fast forward five years, and I was still struggling with where to start. Luckily, last week I was fortunate to be able to take the Digital Preservation Management Workshop. I think the greatest strength of the Digital Preservation Management Workshop (hereafter referred to as the DPM) is that it presents a path with a series of knowable stages. It is organized according to a series of Action Plans divided into three parts: organizational infrastructure; technological framework; and resource requirements. The workshop organizers refer to this as the “three-legged stool” approach. This is a helpful visual that emphasizes the inter-dependency of the three legs. The workshop gradually assembles the stool over the course of the three days, preparing participants to apply the concepts in their own institutional context. The TDR Report outlines what must be in place to qualify as a Trusted Digital Repository. 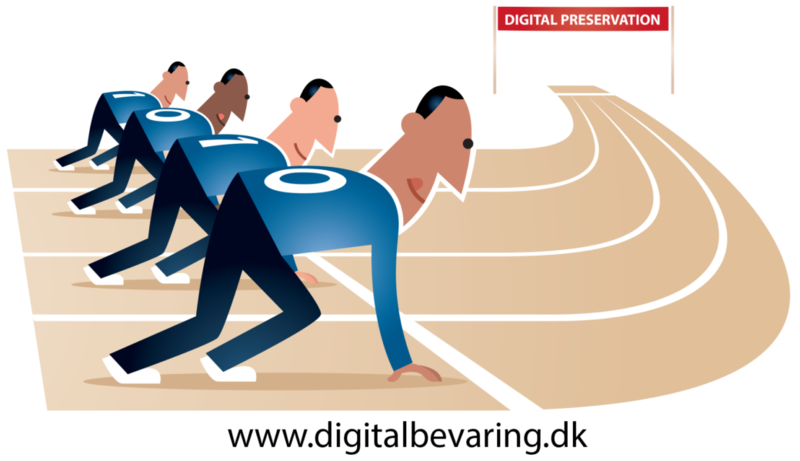 An organization must make an explicit commitment to digital preservation over the long term. There must be a mandate in place and the appropriate resources available and they must be able to demonstrate technological capability and appropriate system security. Fundamental to a TDR is compliance with the OAIS Reference Model. The important thing to understand about OAIS is that it does not provide instructions for building an out-of-the-box solution. It defines the requirements of a system, but it does not outline how to build it. Institutions are free to build their system to meet their specific needs. On Day One of the workshop, the focus was on the development of a robust policy framework that outlines an institution’s commitment to digital preservation in the long term. This important policy foundation must demonstrate compliance with OAIS, identify roles and responsibilities, define issues and challenges, and raise awareness. Nancy and Kari made it abundantly clear that without a solid policy foundation, no digital preservation project or program will succeed. We also discussed the five organizational stages of digital preservation and how to measure our organizations against them. We concluded the day by examining the various legal considerations. Do we have the right to preserve the content? Can we legally access it? Change it? Do we have licenses for the software necessary to render the content? Digital preservation adds a layer of potential legal complications that may not exist for analog materials. I think Day Two of the DPM takes the prize for the most intense day of training I have ever experienced! The morning was devoted to process diagrams and workflows helping us to understand how to work with the OAIS Reference Model. 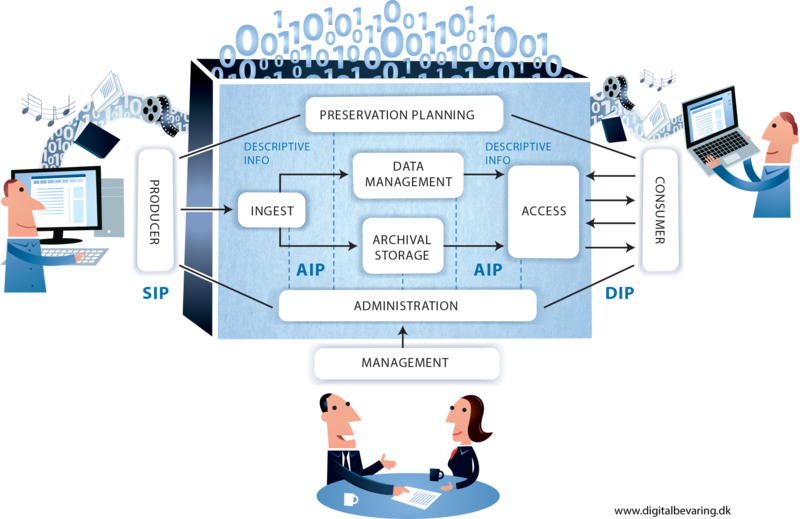 We learned about the ingest of Submission Information Packages (SIP); their transformation into Archival Information Packages (AIP); the management and storage of the AIPs; and eventually the dissemination of the aptly named Dissemination Information Packages (DIP). All of these packages group the digital objects with metadata relevant to each stage of the process. In the afternoon, we were treated to a whirlwind tour of the relevant metadata standards (PREMIS being the main one) and why they are so critically important. By preserving the metadata and relating it to the object throughout the preservation process, we can understand the life story of the object. We are able to guarantee the authenticity of the object and eventually render the content as it was intended. So it turns out that I do not learn through visual representations of complicated concepts. Give me a narrative, every time! That being said, Nancy and Kari acknowledged the many ways that people learn and were good enough to provide narrative descriptions of many of the more complicated workflow diagrams. The experience did make me think about how to represent these complex processes to others. This will be an important skill to develop because this leg of the stool will require productive partnerships with administrators and information technology professionals. Luckily, the DPM provides participants with a host of examples of workflow diagrams from different contexts. Day Three was all about identifying the necessary roles and the relevant skills that are required for an effective digital preservation team. Learning about the skills necessary for this type of work, it made me think that we don’t have adequate digital preservation training in Canada. I would love to see something here like the Society of American Archivists’ Digital Archives Specialist certificate program. The community needs to be equipped with the skills in order to be able to ensure the preservation of born-digital material. University masters programs can equip the next generation with these skills, but we need a post-qualification training program for archivists who are already working in the field. To finish up the workshop, we looked at cost projections for ongoing and contingency costs. Like everything else with digital preservation, there is no one cost model to rule them all. Nancy and Kari offered various cost modeling tools that have been developed by the community, the most useful of which seems to be the Curation Costs Exchange, which provides tools to help understand and compare digital curation costs. One of the main takeaways from the workshop for me was that there is no one-size fits-all solution and there are no specific instructions for how to “do” digital preservation. Like so many other situations in our field, the answer really is, “it depends.” This is a reflection of the complex and shifting nature of technology and the million shades of grey in the archival profession. The DPM teaches you to make sense of this messiness, participate in the discussions, and help the community to move forward. Another significant takeaway for me was the importance of the “open” part of the OAIS model. The need to preserve digital information is shared by everyone, regardless of culture, language, or nation-state. The digital preservation community feels like a giant family that is trying to solve a collective problem. When a possible solution to one piece of the puzzle is discovered, it is important to push it out to the rest of the community so that it can be experimented with, built upon, and improved. I love this sharing model! 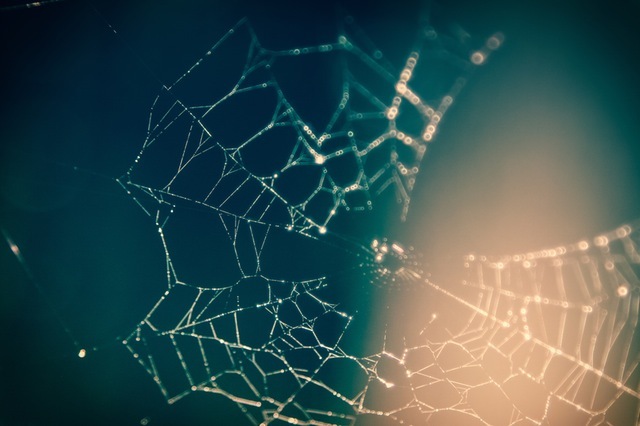 I imagine a complex web of interconnected but distributed nodes working separately but ultimately together to solve a major problem. The DPM broke my brain a bit- but in the best possible way! This post has only scratched the surface of what we learned. I would encourage all archival professionals to take this workshop. After completing the three days, I know that my institution is not quite ready to make a commitment to digital preservation. However, now I feel equipped with some intellectual and practical tools and I can visualize the steps I need to take to enable digital preservation in the future. I plan to start by reviewing available policies and procedures from institutions in similar organizational contexts in order to get a sense of what might be possible for an institution of our size. I will then start to build the blocks of a Preservation Policy Framework that will address the necessary elements of the OAIS. I am looking forward to continuing discussions with my DPM cohort as we travel along the path to preservation. The AABC will be hosting its next Webcast Roundtable on the topic of digital preservation on November 17th, from 10am to 12pm PST. We will be sharing strategies and tools from the workshop and discussing the steps required to develop an effective digital preservation program. Details on how to send in comments and questions via email and twitter will be posted closer to the date. Keep an eye out for the Twitter hashtag and join in the conversation on November 17th. In the meantime, you can check out the recordings of the previous roundtables here. They cover metadata, outreach, archival description standards, and orphan photographs. I would like to thank the Archives Association of British Columbia (AABC) and the Documentary Heritage Communities Program (Library and Archives Canada) for providing the funding to offset some of the costs of this excellent and worthwhile workshop. 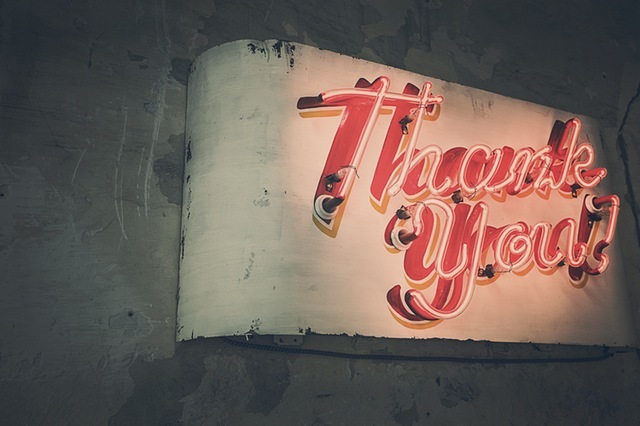 I would also like to thank Nancy McGovern and Kari Smith for their dedication to educating archival professionals about digital preservation. For anyone interested in finding out more about digital preservation, there is a slimmed-down, online version of the DPM workshop available in this handy tutorial.